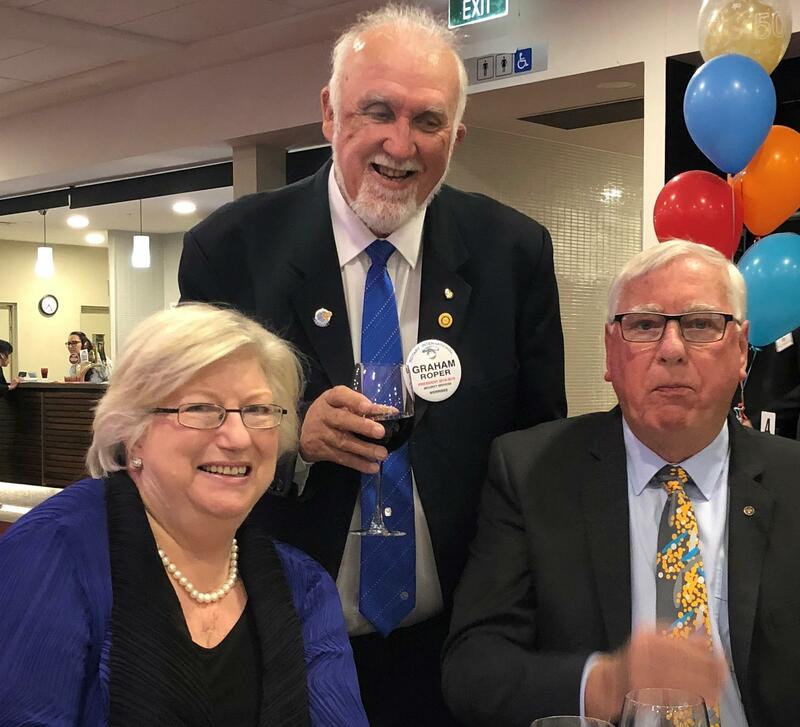 Pictured above - Past RI President Ian Riseley and PDG Juliette Riseley with President Graham Roper. Werribee Rotary Club celebrated its 50th anniversary in fine style on Saturday 18th August at the Werribee Racecourse Function Centre. The evening was a good mix of fun, fellowship, formality, nostalgia and self-indulgence, all appropriate ingredients to make the night something to enjoy and remember. Guests even had a chance to dance in between meals and speeches. A speech from Immediate Past Rotary International President Ian Riseley, Australia's 5th Rotary International President. Presentation of a Paul Harris Fellow (Diamond) and crystal ornament to Past District Governor Colin Muir for his significant donation to The Rotary Foundation. A presentation by President Graham Roper to the club's remaining charter members Past President Tino Ballan and Past District Governor Ian Knight OAM. Music from the band Kartoon who got in the spirit of the occasion by dedicating their first bracket of songs to the 1968 era. The cutting of a special 50th cake by the more senior members of the club, Tino Ballan, Ian Knight, Tom Lentini, Jeff Garfield, Peter Ross, Roland Wade and President Graham Roper. Charter members, Tino Ballan and Ian Knight, who walked down memory lane and told guests about the formation and early days of the club. Club members, Lyn Fava and Rob Fava, who offered some contemporary thoughts about the club and Rotary. Past Rotary exchange students Graeme Pett (Canada - 1970), Yoko Majima (Japan - 1992) and Simone Barbosa (Brazil - 1998) who fondly recollected their 12 months in Australia and expressed their best wishes to their host club for reaching its major milestone. Chris Ochaya from Uganda and his wife Sarah who thanked the club for its support of their Ugandan community farm and who wished everyone well for the celebrations. Click here to view some photos of the evening. There will be more photos available in next week's edition of The Bulletin. Click here if you would like to view or print a copy of the menu. Special thanks to Lexie Smith, Ann Smith, Micki Hovey, Geoff Smith, Phil Purdy, Ross Smith, Roland Wade, Rob Fava and President Graham for all their hard work to make the function a great success. Barry Rassin, the RI President for 2018-19, has sent the club a letter of congratulations for reaching 50 years. In the letter, he said "Since your club was founded, you have had the opportunity to make a significant difference in our local and global communities. I know that you have devoted your time and effort to your club because you have felt what I have felt since I joined my own club in 1980: a true sense of fellowship and purpose. Your dedication to our organization has made all the difference...."
Click here to read the whole letter. Thanks to everyone who attended and for making it a function to remember for the next 50 years.